Citizen volunteer monitoring of the watershed is of paramount importance to understanding its health, as well as, measuring the effectiveness of local restoration and protection initiatives. Water quality monitoring QA/QC practiced by Jeff Hines and Gary Peacock. It takes a while to get from a plan to active monitoring in the field - but we are there! The Plan (Watershed Monitoring Design for York County) was developed by the WAY Monitoring Committee and several cooperating groups including the Alliance for Aquatic Resource Monitoring (ALLARM), Consortium for Scientific Assistance to Watersheds (C-SAW), Yorktowne Senior Environment Corps (YSEC), and Codorus Monitoring Network (CMN). The plan established monitoring protocols and priorities for all of the county watersheds, not only the Codorus. There are site not yet taken and more sites to be added to the list. WE NEED YOU! 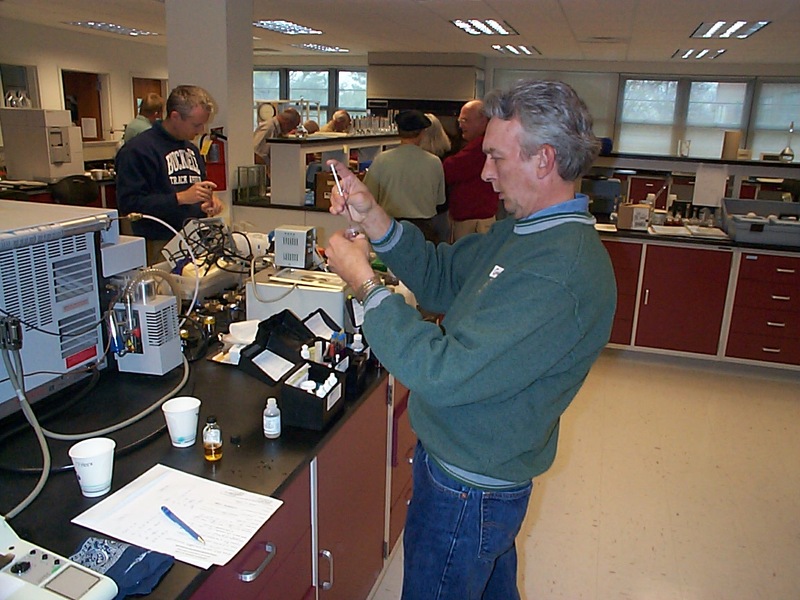 The monitor's test for dissolved oxygen, nitrate, phosphate, alkalinity, pH, and temperature. If you can volunteer a couple of hours a month, we will train you. Please contact Jim Leaman at (717) 843-2929 or John Klunk at (717) 308-0070. CCWA Members -- we have opportunities for you to become volunteer monitors!